Established by Starbucks and some of its leading US suppliers, LeadersUp is committed to closing the opportunity-divide that separates over 200,000 Angelenos ages 16-24 from viable career opportunities. To help make a scalable impact on the youth employment challenge, LeadersUp is joining Starbucks and the coalition of employers and community based organizations supporting the launch of the 100,000 Opportunities Initiative Opportunity Fair and Forum in Los Angeles County. 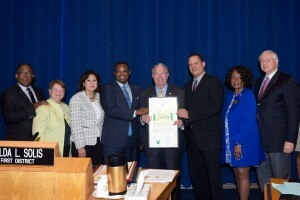 Supervisor Knabe presented scrolls to Blair Taylor, Chief Community Officer at Starbucks and President of the Starbucks Foundation, and Jeffrey Wallace, President of LeadersUp and his team. The 100,000 Opportunities Youth Job Fair and Forum will take place on Thursday, February 11 from 9:00am to 4:00pm at the Los Angeles Convention Center. To learn more about the initiative, please visit 100Kopportunities.org. The Los Angeles County Board of Supervisors approved a plan to allocate $5 million to launch the “Homes for Heroes” program, to better connect homeless veterans with housing. On a motion from Supervisor Don Knabe and Board Chair Hilda L. Solis, the Board approved funding and an 18-month plan to serve at least 1,000 homeless veterans. Late last year, the Board allocated $5 million and requested a specific implementation plan for housing veterans. Today, the Board approved a program with seven specific strategies, including Bridge Housing Strategy, which will work with existing housing providers to serve an estimated 80 vets at any given time with shelter beds while they secure permanent housing; the “Rent to a Veteran” Landlord Incentive Program, which provides landlords with incentives to commit to renting units to homeless vets; and the Move-In Cost Grant Program, which will provide approximately 500 veterans with grants to cover move-in costs, such as security deposits, utility turn-on fees and moving costs. With the implementation of these programs, about $1.2 million of the $5 million earmarked for veterans will remain and will be a part of the package of recommended strategies from the Homeless Initiative to be submitted for Board consideration in February 2016. Los Angeles County Supervisor Don Knabe is proud to announce that the County’s Safe Surrender Program celebrated success for the 17th time this year with the report of a safely surrendered newborn baby boy. This most recent Safe Surrender occurred on Tuesday, December 8 at a hospital in Whittier, and comes two weeks after a baby girl was found buried alive in Compton. This is the 17th Safe Surrender in Los Angeles County in 2015, and the 141st since the program began 14 years ago. The program was initiated by Supervisor Knabe and approved unanimously by the Board of Supervisors in 2001. It allows someone to surrender an infant that is no more than three days old, as long as the infant shows no signs of abuse. 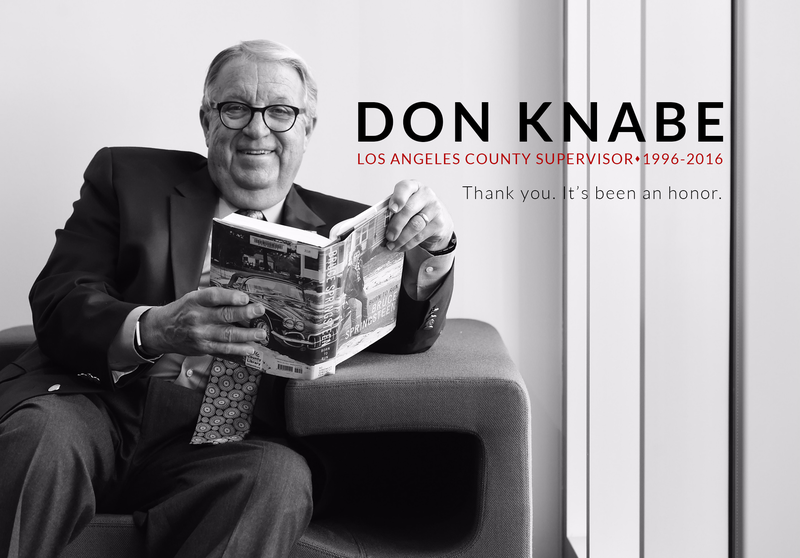 Los Angeles County Supervisor Don Knabe is proud to announce that the County’s Safe Surrender Program celebrated success for the third time this month and the 16th time this year with the report of a safely surrendered newborn baby boy. This most recent Safe Surrender occurred on October 17 at hospital in Los Angeles. Earlier this month, a baby boy was safely surrendered at a fire station in Long Beach and a baby girl was handed-over at a Los Angeles area hospital. This is the 16th Safe Surrender in Los Angeles County in 2015, and the 140th since the program began 14 years ago. The program was initiated by Supervisor Knabe and approved unanimously by the Board of Supervisors in 2001. It allows someone to surrender an infant that is no more than three days old, as long as the infant shows no signs of abuse. Los Angeles County Supervisor Don Knabe is proud to announce that the County’s Safe Surrender Program celebrated success for the second time this week and the 15th time this year with the report of a safely surrendered newborn baby girl. This most recent Safe Surrender occurred on Tuesday, October 6 at hospital in Los Angeles. Two days earlier, on October 4, a baby boy was handed-over at a fire station in Long Beach. This is the 15th Safe Surrender in Los Angeles County in 2015, and the 139th since the program began 14 years ago. The program was initiated by Supervisor Knabe and approved unanimously by the Board of Supervisors in 2001. It allows someone to surrender an infant that is no more than three days old, as long as the infant shows no signs of abuse. Los Angeles County Supervisor Don Knabe is proud to announce that the County’s Safe Surrender Program celebrated success for the second time in less than a week and the 14th time this year with the report of a safely surrendered newborn baby boy. This most recent Safe Surrender occurred on Sunday, October 4 at a fire station in Long Beach. A baby girl was also safely surrendered on September 29 at a hospital in Montebello. This is the 14th Safe Surrender in Los Angeles County in 2015, and the 138th since the program began 14 years ago. The program was initiated by Supervisor Knabe and approved unanimously by the Board of Supervisors in 2001. It allows someone to surrender an infant that is no more than three days old, as long as the infant shows no signs of abuse.